I installed your beautiful plug-in in my Multisite, WORDPRESS updated to the latest version, 3.2.1, but the plugin has stopped working (no display the custom login screen )….:-(. This has happened to others? Yes I just noticed that, I will have a look and track down the problem. I’m really looking forward to any new releases. I didn’t know about the various issues. Maybe you could copy or model some codes from other plugins that allow those features? 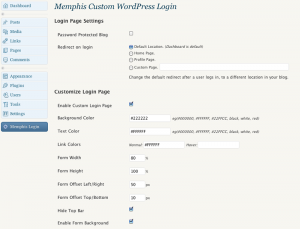 I’ve installed Memphis Custom WordPress Login, and I love it! However, since I cannot insert a separate design for background and login form, I thought I would design a large background image which would include the form design. But when I upload the background image, there is a margin at the top, bottom and left side that I cannot seem to remove. Is there a way to remove this margin? It seems that the color for this margin can be set by “background color” selection within the plugin. What would be truly great is if we could put a design image for the background, and image for the form as well. I really like this plugin, and how it’s always maintained/updated. Any tip or advice would be super appreciated!! Thanks, I’m glad you like my plugin. To answer your question about the form background, its a little complicated to have a form bg, for the simple reason the form is always changing sizes between the error messages and the different types of login pages it never is a constant size. That being said, I think the best solution would be to have some customization to allow user to be able to customize background color, border and other things. I will take a run at that and maybe I a new release with these features in the future. hey ken, i’ve been testing on normal wp sites, multi users sites no problem. Maybe try and uninstall and then reinstall the plugin maybe that may do the trick. KK im on it should have it fixed in no time. Hello your Memphis Custom WordPress Login dont seem to work,after i installed it and has added details like colors i cant save it,does it work on the newly wordpress vertion?